We always make potato gnocchi in our family but you can find them made from semolina, bread or ricotta. The quantities below will feed 4 people handsomely. Now for the fun bit! Roll the dough into long sausages about 1.5cm thick then cut into pieces on the diagonal about 1.5cm wide. Press them gently in the middle to form a little scoop where the sauce can sit nicely. As soon as you have finished them, place them in a pan of boiling water with a pinch of salt. They should float to the surface after just a few minutes when you should remove them with a slotted spoon. 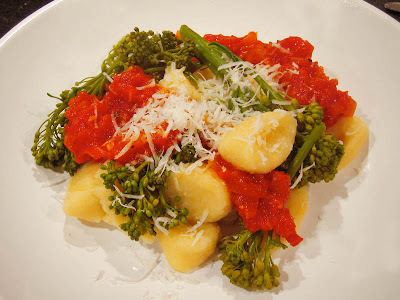 In our neck of the woods, we like to serve them with broccoli or cauliflower, a bit of thick, basic tomato sauce and a good shaving of Parmesan or Pecorino. The greens really do help to balance the dish and prevent it being too heavy. A brilliant cheap eat dish!